Elizabeth B. Keeney. 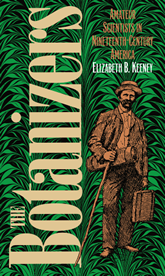 The Botanizers: Amateur Scientists in Nineteenth-Century America. University of North Carolina Press, 1992. Keeney examines the role of botany in the lives of nineteenth-century ‘botanizers,’ amateur scientists who collected, identified, and preserved plant specimens as a pastime. Using popular magazines, fiction, and autobiographies of the day, she explores the popular culture of this avocation, which attracted both men and women by the thousands.